The connect must be in towards to the arrows before you plug in the power supply. Don't left them on the spool when you testing them more than 2-3 Mins.They need to dissipating heat. Clean the surface before stick on the strip.If it is not sticky enough, you can add some double sided tape. 8 Light Pattern: Quick / Slow / Auto / Flash / 7 color fade change / 3 color fade change / 7 color jumpy change / 3 color jumpy change R / G / B increase and decrease control. When it's pressed first time, will enter the DIY color mode, you can adjust the color per the 6 keys at above to increase and decrease the R/G/B color by yourself freely (if other keys is pressed this time, will jump out from DIY color mode). And you can save the color which you have adjusted by pressing the DIY key once again. When next time you press this key, it will show the color you saved last time. 6 DIY keys. They are all independent, have no effect each other. For example: if you press DIY key 1 first, and then press DIY key 2, DIY key 1 will be invalid, until DIY key 2 is pressed once again, current color will be saved. ENVIRONMENT PROTECTION: Flexible LED Light Strip energy saving, high brightness, low heat, low energy consumption, pollution-free, small size, no radiation, and beautiful multi-colored. IP65 Waterproof Led lighting strip, ideal for both interior and exterior decoration. FLEXIBLE OPERATIONS: Slim, compact and flexible PCB strip. Mount end-to-end for bendable or angled patterns, or in continuous rows. 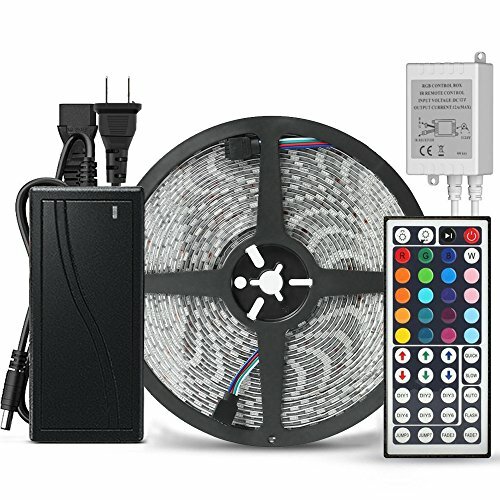 Color changing RGB LED strip light kit with 44 keys IR remote controller and power adapter. EASY INSTALLATION : LED strips are equipped with adhesive tapes on the back so they can be attached directly and applied anywhere. LED Strip lights is used for indoor decoration on festivals, events, Halloween and birthday party under cabinet, TV, dining room, bedroom, party, wedding. CUTTABLE AND LINKABLE: Light strip are easy to cut. Every 6 LEDs can be separated with scissors along the cutting marks without damaging the rest of the strip. Need connectors to link them together after you cut. NOTE: when connecting the control box with the lights, the arrows should be placed on the same line. SAFE TO USE: Low power consumption, Super-bright but running with low temperature. Flexible operations. Slim, compact and flexible PCB strip. Reduce re-lamp frequency. Lifespan is over 50000 hrs. Friendly tips: 12 month warranty, 30 days money back guarantee. If you have any questions about this product by guaiboshi, contact us by completing and submitting the form below. If you are looking for a specif part number, please include it with your message.